The 13.5m Fatcat is hard to ignore. When I first saw it outside the builder’s Mercer factory I just had to stop for a better look. 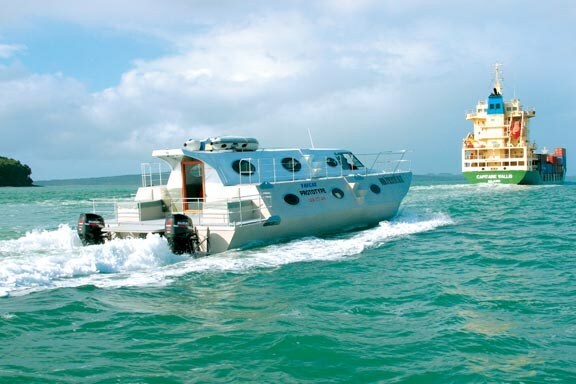 A similar thing happened during our recent boat test on the Hauraki Gulf: the harbour pilot passed us and then doubled back for another look. Virtually every boat we passed had people doing a double-take. Builder Charles Bree is well-known for his plastic boats. 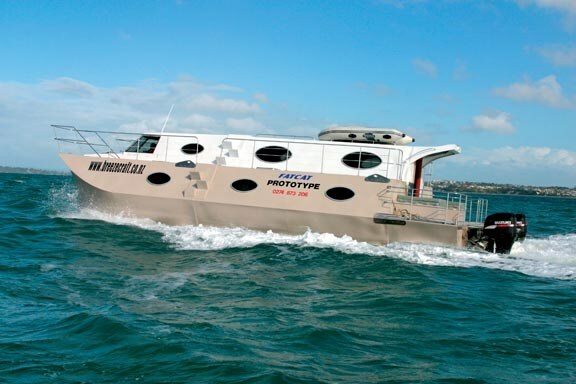 These range from kayaks and small utility dories to 4.1m utility catamarans and the 6.3m "Tuffcat". The Fatcat is Bree’s latest design and he claims it is the world’s largest moulded polyethylene catamaran. The construction of this boat is like no other. Using rotationally-moulded polyethylene it essentially comprises hexagonal modules joined together. Each hull has three moulded sections bolted and welded together. The main cabin uses a further two sections. Each section is more than two metres wide, providing considerable interior space. The bottom of the hull sections are V-shaped to give an appropriate hull contour. The front sections have shaped bows, while the rear sections are equipped with moulded outboard pods. Module walls are 30mm thick, and this increases to 45mm for the underside of the hull. The polyethylene is also completely UV-resistant, and never needs painting since the pigment is embedded in the plastic. The plastic is also extremely resistant to weed growth and under most conditions no anti-foul is needed. So it’s a low-maintenance boat and the polyethylene will outlast most other construction materials. Hull design is also strong. Despite the inherent flexibility of polyethylene, the hexagonal sections give rigidity to the whole structure. No ribs are required, giving the interior of the boat clean, uncluttered lines. The sections are bolted together with stainless steel bolts. Bree says structural tests show there is no twisting moment on any of the bolts. The sections are also welded togeth-er, more for aesthetics than any need for the extra strength. Load-bearing tests show that the hull would be strong (and big) enough for landing a helicopter. 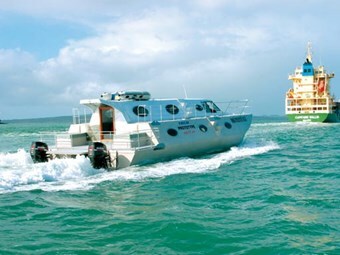 This is a big boat, measuring just over 13.5 metres overall (45ft), with a 12-metre waterline length. The 5.7m beam provides excellent stability – something emphasised on our test day. The sea was running a 1.5m chop which made the photo boat bounce around like a cork, while inside the Fatcat it was possible to walk down the centre of the cabin without holding on. The cat held her course faithfully, even with a quartering sea, and handled the conditions with ease. 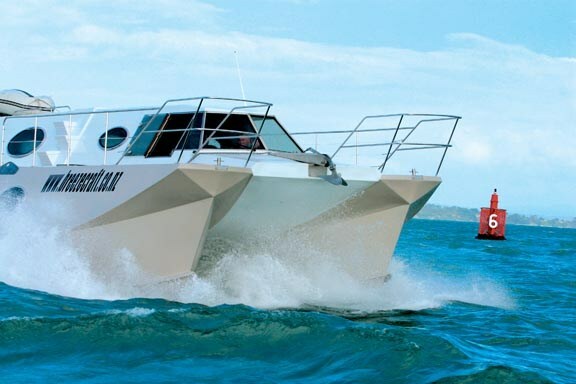 The Fatcat is powered by a pair of 250hp Suzuki four-stroke outboards that push the nine-ton boat to speeds of around 30mph. Bree has been experimenting with different propeller combinations and says further testing is needed to find the best mix. There are also two large engine compartments set into the hulls, allowing the installation of inboards and sternlegs if preferred. Inside, the cabins offer ample headroom. At present there are seats running down the full length of both main cabins, with a centred helm station up front. Modular kitset furniture is available, allowing the upper cabins to be laid out as a galley or saloon. A few moulded tables have been fitted to the prototype boat, creating working surfaces as well as ample storage within the modules. The lower part of the boat is laid out with four cabins, two in each of the hulls. These allow a full-size double bunk and two single bunks in each cabin. Other layouts are possible. A toilet unit is fitted into one cabin, and there is ample space for another toilet or combined toilet and shower to be fitted in matching cabin in the other hull. Cabin walls require very little finishing. The moulding process leaves clean, smooth walls which are not unattractive. However, upholstery or timber veneer is an option. Visibility from the cabins is through oval portholes, and the only real drawback of the boat is the lack of window space. The helm station has huge rectangular windows to each side, but occupants of the saloon have considerably smaller windows which cannot be opened. Bree has mitigated this somewhat by installing a transparent rear door, but I feel the boat needs more window area. He says the prototype was designed with extreme weather in mind and other window layouts are available. All the mouldings for the windows, doors, hatches – as well as the kitset furniture – are made by Breezecraft. Deck space is expansive. Bree has fitted rails along the full length of both sides, and the boat could have a dozen people fishing off a side with ease. Given the huge amount of buoyancy in each hull I wouldn’t expect any problem with weight distribution. Moulded steps make it easy to get on and off the boat from a dock, although a dive ladder would be needed to get on the boat from the water. The deck could benefit from some sort of anti-slip surface, since the smooth plastic is quite slick when wet and Bree has indicated this is something he would improve on. The rear deck of the boat, covered in marine carpet, is huge and a great place to relax in the sun. Unfortunately, with 40-knot winds and a huge swell on our test day, relaxing on the afterdeck for sundowners was not an option. At speed this deck was surprisingly dry, with very little venturi effect. This also meant that we could leave the rear cabin door open without any spray being sucked inside. In fact there was very little spray at all at speed, apart from that generated by the wind. Manoeuvrability was good for such a long vessel, with a turning circle at speed of about 50m. With twin engines, at low speed, the boat can be turned within its own length. Getting into a tight berth is simple. Bree says a bow thruster can also be fitted on request, though this seems unnecessary. The boat was very stable at rest, as is to be expected on a twin-hull with such a broad beam. Powering up to speed was interesting, as there is no sensation of the boat coming up onto the plane. Acceleration is smooth and effortless, and the boat just steadily "lifts" itself out of the water. At speed the top of the tunnel between the hulls is more than a metre above water and we didn’t feel any hits from the swell. There is some bumping sensation through the floor when striking the chop, but this is both smoother and quieter than a solid fibreglass hull. Top speed was around 30mph. As is common with large cats in rough chop, the boat was smoother at speed than at low speed. Bree has not yet done any fuel consumption tests, and it will be interesting to see what the figures turn out to be. My only criticism of the hull layout is that the driver has very little rear vision. From the helm position he cannot see the outboards, and has to either look down the cabin or open a window and look out to see behind the boat. Bree is planning to install a mirror as a standard fitting. He also plans to have (as an optional extra) two CCTV cameras and monitors to enable the driver to easily perform close manoeuvring without requiring an assistant. Bree was at lengths to point out that this is the first concept boat, and improvements will evolve with more on-the-water tests. He has already indicated he would like to give the bows a softer entry to the waves, making them slightly slimmer for better wave piercing. Since the moulds are steel, and Breezecraft controls the entire manufacturing process, changes like this can be made in a matter of days. Bree has patented the design of the boat, and MSA certification for up to 50 passengers. The report indicated that the hull structural design exceeds the requirements, making this the ideal boat for a commercial water taxi, houseboat, live-aboard dive operator, extended charter operation or work boat.